Cain is back, and he’s been busy. After a death row inmate, Tommy, mysteriously vanishes, Sam and Dean head to the prison, their first assumption being tulpa, demon, or something else supernatural. And it is their type of hunt, just not in the way they expected. After a quick look at the security footage, Dean recognizes right away who’s behind it--- our very own Father of Murder. He’s not the only one who has returned. We find Castiel, who has been busy torturing and killing demons for information regarding Cain, standing over what appears to be a mass graveyard of victims much like the dead inmate, moments before Cain appears. After fighting the Mark’s thirst for blood for so long, he’d gotten the taste back, turning his focus to killing people who carry his “disease.” Entire families, descendants of his---murdered, whether or not they’re killers themselves. He assures Castiel that he’s “living proof” there isn’t a cure for the Mark, disappearing with a promise that he will get to Dean in due time. At the bunker, Team Free Will has reunited, in research mode to try to find Cain’s next possible victim. They find out the inmate, Tommy, has an estranged son who lives in Ohio. Castiel and Sam both know that bringing Dean anywhere near Cain is probably the worst possible idea, but Dean refuses to stand down and allow an innocent kid to be murdered, even if it means having to kill Cain. It’s a fight that all of them realize Dean may not come out of the same, even if he survives it. This is the Dean we all know and love, willing to throw himself constantly into harms way for the sake of others, knowing deep down that he’ll end up dead, or worse. He’s been doing good so far, fighting the Mark, but using the Blade against Cain himself is sure to throw all that hard work right out the window and end in disaster, possibly bringing him to an even darker place than before. Back in Hell, Rowena is digging her claws deeper and deeper into her son’s affairs, subtly nudging Crowley around like a chess piece of her own design. He’s suspicious of her sudden usefulness, but he’d not as ignorant as he’s led her to believe, quickly realizing it’s all manipulation, that she’s got other motives. She convinces him to agree to help her get take out the witch from the grand coven who led the charge against her, but when his old pal Dean calls claiming the King is on Cain’s kill-list, he drops the plans with Rowena immediately to bring them the Blade, and she’s not happy about it. Cain’s plan to kill the boy is foiled almost immediately. 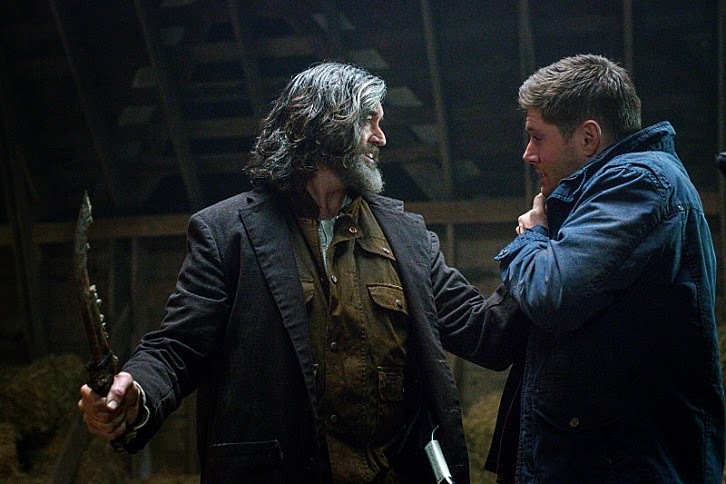 The real kid is long gone, and the boy that he stabs is part of an illusion--- set to keep Cain trapped long enough for Dean to prepare himself for the next step: taking the Blade and stepping into that barn for a final face off. In the moments before Cain is ready to end Dean’s life with the Blade, he drops some major foreshadowing on us (though, at this point, enough of these hints have been dropped over the seasons that it’s pretty hard to ignore it’s likely to be true). “My story began when I killed my brother, and that’s where your story will inevitably will end.” Before Cain can land the finishing blow, Dean pulls another blade out of Cain’s jacket pocket, slicing off the hand holding the Blade. The complete and utter fear in Dean’s eyes is obvious as he stands up, now armed with the weapon, all but begging Cain to assure him he doesn’t have to kill him--- a request he denies shortly before Dean plunges the knife into his back. With the others, Dean returns to blade to Castiel to put somewhere safe, betraying the promise between himself and Crowley that he would be the one to have it back. He and Sam exchange a hug, and a heartbreaking one at that. When they return to the bunker, Sam tells Dean what he did was incredible, but deep down, he knows something isn’t right, just as they feared. “You couldn’t BE more transparent.” “Well DUH.” Okay, but, and I’m being completely serious here--- can we have a Crowley and Rowena spinoff? Can you imagine the sitcom possibilities? Crowley trying to deal with his Hell responsibilities while dealing with his insufferable, witchy mother, laugh tracks, the whole nine yards. “#CainsBeard” was trending for a lot of the episode on Twitter, and I can’t say I’m surprised. Timothy Omundson’s glorious locks pretty much made the episode for me, not gonna lie. On a more serious note, though, he gave me chills on more than one account, his portrayal of Cain probably one of the scariest “bad guys” on the show, even compared to all of the demons and monsters. I was certain I was going to require medical attention during the face off between Cain and Dean. As a matter of fact, it’s possible that I still do. No more episodes until March 18th, when CW shifts Supernatural over to Wednesday nights, so until then, just try to survive the Hellatus. I’ll be back then!